There are some radical new designs in juicer feeding tubes. We take a look at four of the newest ones. We often get questions from customers asking why all juicers don’t have wider feeding tubes. The reason is that government regulations specify a maximum width of feeding tube as a safety measure. This is to prevent children from being able to reach their hands into the juicer while it is operating. In the past few years, some manufacturers have gotten around this restriction by making wider feeding tubes with different types of barriers in the tube to keep out hands and fingers. 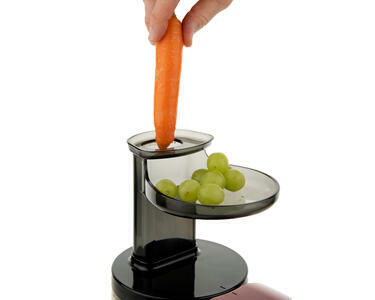 Juicers with wider feeding tubes are often promoted as being the easiest or most convenient to use. Pictures (sometimes digitally altered) show whole large apples being inserted easily into the feeding tube with no cutting required. In our experience, a wider feeding tube doesn’t necessarily give the best results or save much time. We compared four juicers for this article, making the same juice recipe in each juicer. This recipe consisted of 500 g carrots, 5 kale leaves, 125 g spinach, 125 g blackberries, and 1 medium granny smith apple. This wide variety of produce allowed us to evaluate the ease of use with each different type of feeding tube. For example, one feeding tube might work well with apples, but not with spinach due to the design. 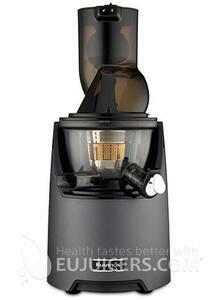 The first juicer we looked at is the Omega MMV Mega Mouth vertical juicer. We have tested this model extensively. We consider it to be the standard for quality wide-mouth juicers, and we were curious to see how others would compare. It uses a 78mm wide feeding tube with a blade inside the tube for safety. The second juicer we looked at is the new Kuvings Evolution juicer. 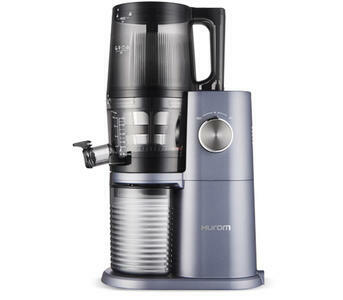 Released in 2018, this is their third generation of vertical juicers. While the motor and juicing process is similar to the second generation version, the feeding tube is a little wider at 82mm and uses a hinged “trap door” system for safety. 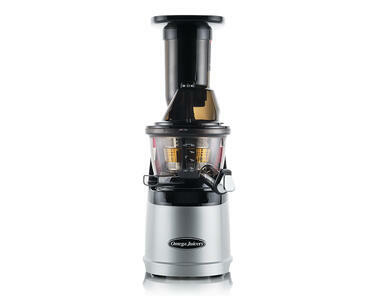 For the standard mouth juicer, we tried the new Sana 828 vertical juicer. Just released this month, this juicer has a standard size feeding tube, as well as a side tray for smaller things like berries and cherry tomatoes. We were curious to see if the side tray offered any real benefits. Finally we tried the new Hurom HA-I juicer. This juicer is unlike any we’ve seen, and uses a cylindrical bowl with a rotating blade attached above the juicing assembly. It looks a bit like a mini food processor. Produce is first cut by hand into small pieces and put into the bowl all at once. 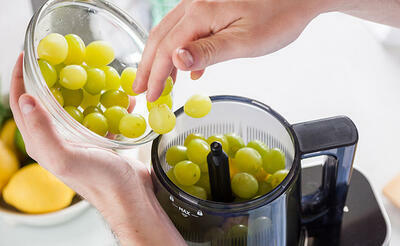 When the juicer is turned on, the blades pulls down the pre-cut ingredients into the juicer. The benefit is that you needn’t hand-feed each ingredient into the feeding tube. Omega MMV: The wide mouth feeding tube on the Omega MMV made feeding most produce pretty easy. Having an integrated tray around the feeding tube is especially helpful with spinach, as small spinach leaves tend to fall into the juice bowl unless fed very carefully into the tube in small quantities. However, we also noted that the complex shape of the feeding tube meant that some spinach leaves got stuck inside where the auger couldn’t reach. The feeding tube wasn’t wide enough to accommodate a medium-sized granny smith apple, so we had to cut it into quarters. Carrots were processed easily, although we did experience a couple of auger jams with larger carrots. This is easily fixed by reversing the motor for a few seconds. The kale and berries processed without problem. It took just under 7 minutes to juice the ingredients and then clean the machine afterward. Kuvings Evolution: The Evolution performed similarly to the MMV, although the trap door system was trickier to use. The larger feeding tube was helpful with the apple, as it was the only juicer able to take a medium-sized apple without cutting. However, the trap door system was awkward with berries and especially the spinach. Only a small handful could be fit in at a time, and there was no tray to catch any extra leaves that fell. Like the Omega, the Kuvings jammed a couple of times on larger carrots, despite the powerful 240-watt motor. 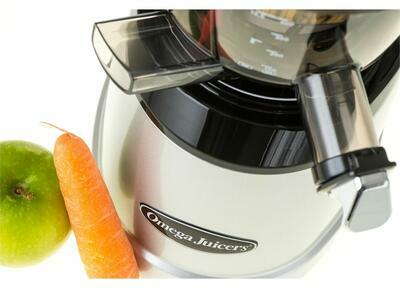 Juicing and cleanup time was almost identical to the Omega at an even 7 minutes. Sana 828: We were pleasantly surprised by the side tray and opening on the Sana 828. While we thought it would mainly be useful for the berries, it proved to be a real time saver for the spinach. Large handfuls of spinach could be pushed in the side opening from the tray, and then fed into the juicer easily with the pusher. It’s a simple design, but a surprisingly useful one. 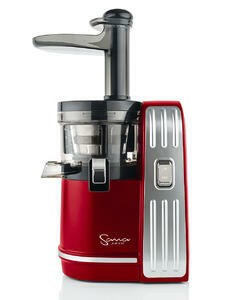 The Sana 828 uses a twin-bladed auger which cuts the produce into smaller pieces as they enter the juicing chamber, unlike the large juicers which use brute force to crush larger pieces. This means the carrots fed more slowly into the juicing chamber as the auger sliced them into pieces. We only experienced one jam, and that was with a particularly fat carrot. Besides cutting the apple into smaller pieces, prep time was the same as on the wide mouth juicers. Total time of prep, juicing, and cleanup was about a minute more than the wide mouths at 8 minutes. Cleanup was much easier with the 828 due to the simple tube design. Hurom HA-I: We tested the Hurom using its “smart hopper”, which stirs and cuts the ingredients before sending them into the juicing chamber. 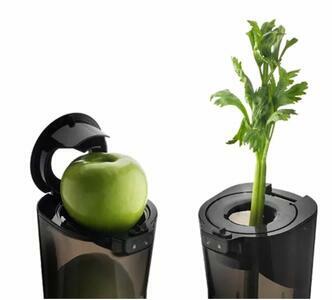 In theory, this is the widest mouth juicer ever, as you can fill the entire hopper bowl with produce. However, since ingredients must be cut into 3-cm pieces, prep time took much longer. Due to the capacity of the bowl, we had to fill the hopper three times to complete the recipe. But while it was processing the first bowl, we cut and prepared the produce so it would be ready when it was time to refill the bowl, saving some time. Because everything was cut into small pieces manually and then again by the smart hopper, there were no jams at all. The need to prepare the ingredients and refill the hopper twice made it the most time-consuming of the tested juicers, taking 10:30 start to finish.